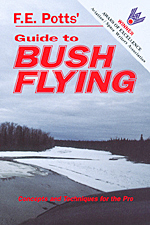 This book contains methods and/or flying techniques that have worked successfully for the author (as well as for other professional bush pilots) for many years. However, for those without the required skill, experience, or judgment, these techniques (because they utilize the edges of the airplane's performance envelope, close to the stall; or require operation low to the ground; or push weather) are very dangerous. They cannot be properly or safely learned just by reading a book, but require practical, hands-on instruction. Therefore, pilots wishing to learn these advanced techniques should take thorough instruction from a Certified Flight Instructor qualified in bush techniques, then understand [see FAR Part 91.3(a)] that pilots who elect to use these techniques must of necessity accept all responsibility for their own and their passengers' safety and property. Every effort has been made to make this book as complete and accurate as possible. However, there may be errors, both typographical and in content. Therefore, the book should only be used as a general guide as to how some professional bush pilots, including the author, operate, and not as an instruction manual. The purpose of this book is to educate and entertain. The author and ACS Publishing shall have neither liability nor responsibility to any person or entity with respect to loss or damage caused, or alleged to be caused, directly or indirectly, by the information contained in this book.